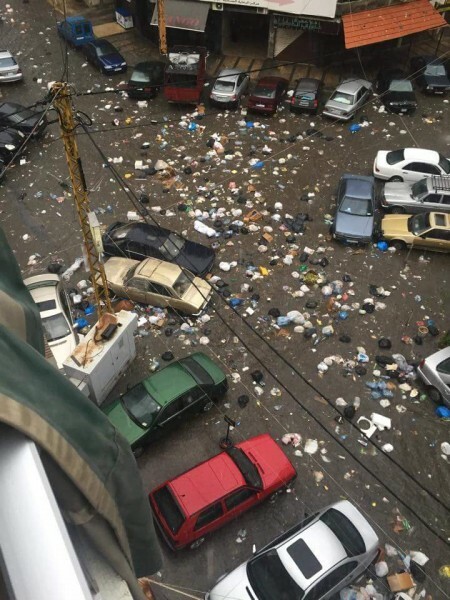 It rained in Lebanon, and Beirut's rubbish, which has been pilling up alongside roads for months, turned the capital's roads into “rivers of garbage.” The mounting rubbish, which activists have been protesting against for months, clogged up the city's drainage system, and fears of a cholera epidemic don't seem unrealistic. What will we tell our children tomorrow? That we are the generation which witnessed the flood of rubbish? That we are the generation which saw cholera outbreaks? And when they ask us why that happened, what do we tell them? Do we tell them we are sorry because we were occupied with the problems of politicians with each other after they convinced us that they are our problems and did not allow us to unite? What do we tell them? That a number of young men and women took to the streets and we did all we could to stop them? The secular You Stink, or Tol3et Re7atkom movement, started a wave of protests in August which attracted thousands of Lebanese from all walks to life to protest against the trash crisis, which soon expanded to include a broader range of demands as other groups joined the demonstration bandwagon. It kicked off calling for sustainable solutions to the waste problem, and got people on the streets, but the situation quickly escalated beyond trash towards addressing larger problems related to corruption within the current government. From the primary concern of protesting against the officials’ mishandling of the refuse problem following the closure of the country's largest landfill in July, protesters called for the government's resignation, an end to corruption and fresh parliamentary elections, among other demands. Lebanon, already suffering from a poor infrastructure and daily electricity cuts, has had no president for over a year. In 2009, its parliament extended its term until 2017, with no elections, citing instability as a reason. He also shares this photography post, showing photographs to roads with overflowing rivers of garbage. On social media, bloggers were quick to share videos and photographs of the crisis, they have spent months warning people about. This tweet has been retweeted 130 times so far. So how many local groups have you set up to start recycling and cleaning up your own rubbish?